Light blue-green to purplish 3/4" flowers in long, dense, 20" racemes in April to July. Vigorous hardy perennial to 7 feet, with palmately divided 6" leaves. California. Drought resistant. Magnificent. Zone 8. Prechill seed. 'CARDINAL LARKSPUR'. Bright scarlet 1 - 1 1/2" long flowers with yellow on the upper petals, and long spurs, in airy clusters covering the plant. Tall perennial to 3 - 6 feet, with divided leaves and long thick roots. Central California and south. Hardy to Seattle at least. Germinates in 2 - 4 weeks. 'JAPANESE PERSIMMON'. Delicious orange fruits on a small tree to 40 feet. Pale yellow flowers. E. Asia. Zone 7. "From our own seedling trees that have done well in Tennessee, and that we selected from over 1000 seedlings. In 2007 in full leaf with new growth evident, we went to 16°F, which killed a 4" diameter trunk to the ground. We cut it off and it regenerated, missed a year of fruiting, and fruited the following year. "—Sue Turt1e. Striking variety with red leaves. Unusual! Germinates in 1 - 3 weeks. CACTACEAE. Three species of tiny cacti. 'HIKULI MULATO'. Tiny globular cactus to 1 1/2", densely covered with minute white spines. Small pink 1/2" flowers, followed by bright pink fruits. South Texas to México. Zone 8. Used by Tarahumara shamans to 'heighten perception and clear the senses'. Needs excellent drainage. COMPOSITAE. South African aromatic shrubs. 'AFRICAN ROSEMARY', 'SNOW BUSH'. Dense white flowers with purple eyes cover the shrub in winter and spring, followed by woolly seedheads. Aromatic shrub to 3 feet, with soft, needle-like leaves. South Africa. Zone 9. Stands drought and seaside conditions. Tea used for coughs, colds, as a diuretic, and for heart troubles, and as seasoning. 'CULANTRO', 'FALSE CORIANDER', 'RECAO DE MONTE', 'SPIRITWEED'. Evergreen herbaceous perennial to 1 foot, with spiny toothed leaves and tiny white flowers. Tropical America. The favorite leaf to flavor soups, it is indispensable in Latin-American cooking. It has a flavor like Cilantro (Coriander) but is stronger. It has been adopted by S.E. Asian cooks. It is a highly regarded folk remedy for high blood pressure and fits. Germinates in 2 - 4 weeks, some lots dormant and need GA-3. Double and semi-double flowers in shades of pink, cream, and white, with darker streaks and rippled petals. Very nice! 'BRIDAL WREATH'. Small pink and white 4-petaled flowers in long sprays, July to September. Hardy perennial to 2 feet, with rosettes of lobed leaves. Chile. Zone 4. Germinates in 2 - 4 weeks or may be irregular. 'CHECKERED LILY', 'SNAKE'S HEAD'. Showy nodding 2" bells checkered reddish purple and white, in late spring. Hardy bulb to 1 1/2 feet, with narrow leaves. Europe. Zone 4. Best in damp soils. Needs warm-cold-warm to germinate, make take a year planted outdoors. Just sow in a pot and leave it—easy! 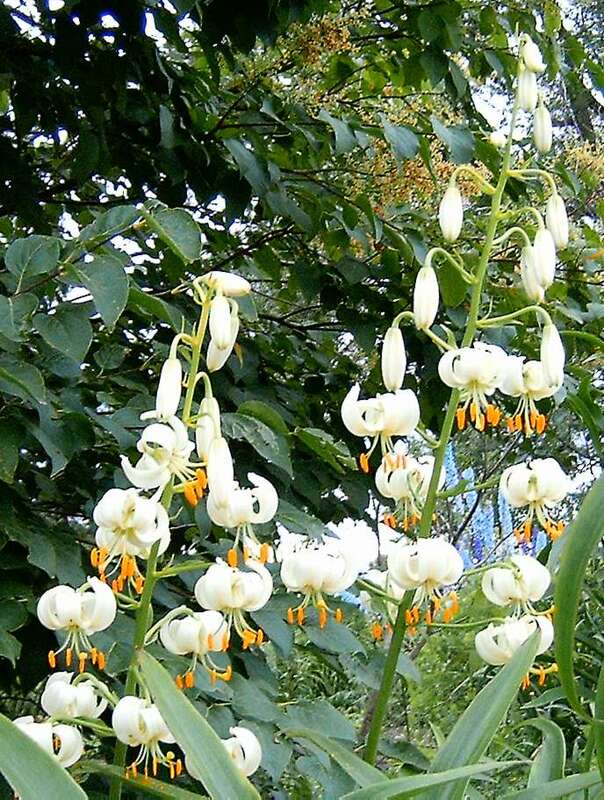 Large spikes of nodding 3/4" bell-shaped greenish-cream flowers in April and May. 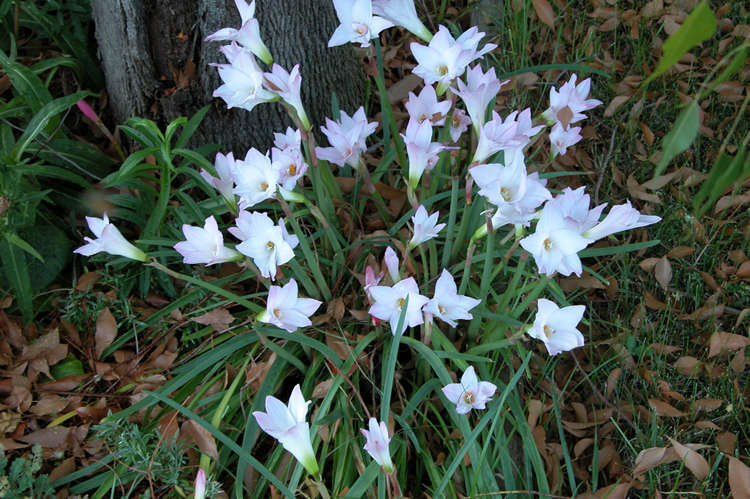 Hardy bulb to 2 - 8 feet, with grey-green leaves. E. Mediterranean. Zone 8. Germinates at cold temperatures. 'CHIMPU-CHIMPU'. Vivid red trumpet-shaped 1 - 3" flowers in hanging clusters in late summer and fall, followed by small edible fruits. Fast-growing shrub to 6 - 18 feet, with 2 - 8" leaves. Peru and Bolivia. Zone 9. Part shade. Can regrow from the base after hard frost. Leaves diuretic, flowers used for menstrual irregularity. Attracts hummingbirds. Surface sow seeds, may flower in as little as a year. FUMARIACEAE. Ornamental and medicinal annual and biennial herbs with finely divided ferny leaves. Excellent in the wild garden. Abundant spikes or small white, purple-tipped flowers in spring. Sprawling annual with attractive divided foliage. A nice winter annual here in central California, good for naturalizing. Germinates in 1 - 4 weeks, best at cool temperatures. 'PRAIRIE' or 'TRAPPER'S GENTIAN'. Deep blue inch-long bell-shaped flowers in June and July, on a small perennial to 4 - 12". Northern California. Zone 8. Sun to part shade, stands drought. Pinkish-purple 1 1/2" five-petaled flowers in clusters to 2 1/2 feet tall. Hardy perennial with 4" leaves, rising from a small caudex. South Dakota to California. Stands drought and poor soil. The flowers are edible, and the plant is used as an insect repellant. Nick lightly to germinate in 1 - 4 weeks. 'GREAT VALLEY GUM-PLANT'. Bright yellow 1 1/2" flowers in summer, on a perennial to 4 feet or more, with narrow leaves. California. Zone 7. Stands drought and salt, and is a prime pollinator attractor. The resinous flowers and tips are used for dermatitis, lung problems, and as a sedative. Germinates in 1 - 6 weeks, best with a one week prechill. AMARYLLIDACEAE. 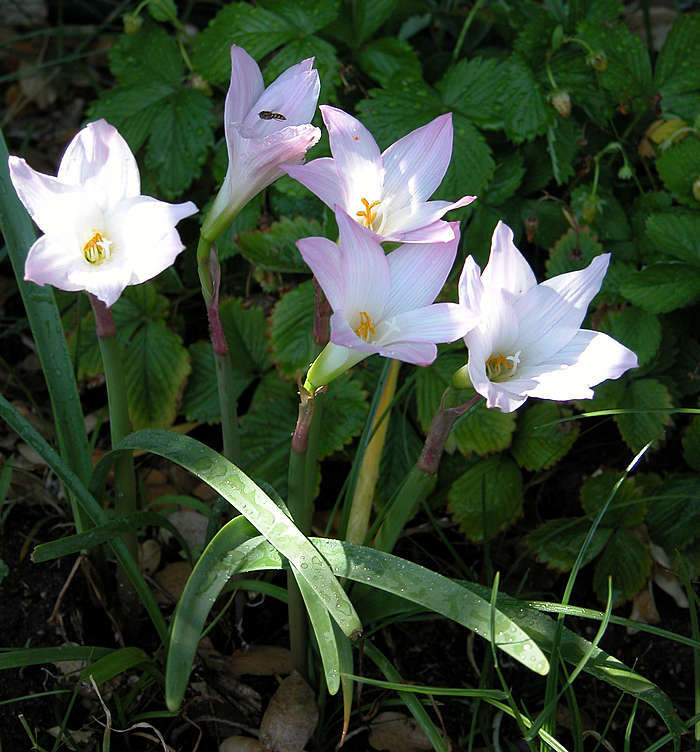 Central and South American bulbs related to Hippeastrum and Zephyranthes. Easy in full sun, part shade, good in sandy soil and in pots. Outdoors in California and the South. Large, rosy-pink 3" long and wide flowers with green throats, borne on 9" stalks in spring, before the leaves. Narrow blue-green leaves. Argentina. Zone 8. Evergreen in California. Germinates in 1 - 3 weeks. 'ROSILLA'. Odd yellow flowers turn purple brown, forming round balls on long stems, the small yellow ray-flowers like a short skirt at the base. Perennial to 3 - 5 feet. California. Zone 8. Good in dried arrangements. Germinates in 1 - 2 weeks. 'IMPHEPHO'. Dense clusters of deep yellow flowers at the branch-tips, on a shrubby perennial to 1 - 3 feet, with fuzzy, silvery leaves. Southern Africa. Zone 8. The highly aromatic leaves are used as incense and are smoked for insomnia and to produce dreams and trance. 'WESTERN SWEETGRASS' . Graceful nodding panicles on an evergreen bunch grass to 18". Forests, California to Washington. Zone 8. Sweetly vanilla scented, used for making sweetgrass braids for incense. Best in part shade. MARTYNIACEAE. Two species of Unicorn-plant-like annuals, grown for the attractive foliage, flowers and peculiar pods. Easy in warm sunny spots. Germinates irregularly up to 8 weeks or so. 'YELLOW UNICORN PLANT'. Bright yellow, flared, trumpet-like inch-long flowers, deeper yellow or orange inside, sometimes spotted red, in dense clusters held above the leaves. Hardy spreading annual to 1 foot tall, with round leaves 4 - 12" across. Peculiar 2" pods with long, curved 4" horns. S. America. 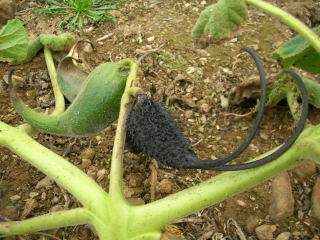 The ripe pods are useful in dried arrangements, an interesting change from the regular type (Proboscidea). The young pods have been eaten pickled. Give GA-3 to germinate in 3 - 4 weeks. Light blue flowers with a darker star, on a hardy annual vine. Originally collected in Tijuana, where it 15 called quebraplatita ('little broken plate'). When the flowers are crushed in the palm, they look like a tiny broken plate. Nick seed. Fully double peony-like flowers in shades of pink and white. Unusual and striking! Nick seed. Bred for fragrance, the large white flowers have purple-tinged edges, and are the most highly-scented sweet peas available. —Lilium Mackliniae 'Naga Form'. (15) LILY-56N. 'MANIPUR LILY'. Large nodding deep rose flowers in summer. Hardy bulb to 3 feet. NE India. Zone 6. Irregular, root germinates in 2 weeks and up. Pure white flowers to 2" across, in long, green-stemmed racemes to 3 feet. Nice. Sow April to June, root germinates in 3 - 8 weeks with leaf growth the next spring. Large fragrant 10" funnel-shaped flowers in July. To 3 feet. Philippines. Germinates readily in 3 - 6 weeks at warm temps, grows and blooms quickly. Masses of white tubular 1/2" flowers followed by 1/4" orange berries that ripen black. Thick-stemmed shrub to 3 - 6 feet, with tiny succulent leaves. Endemic to dry rocky areas of north-central Chile. Zone 9. 'WILD TOMATO'. Deeply divided grey-green leaves and large bright yellow flowers followed by clusters of greenish edible fruit. Perennial to 3 feet, from dry rocky parts of northern Chile. Zone 10. Used for breeding disease resistance into tomatoes.